“Yes, we're open!” Being open when you said you would be open matters. Recently, I needed a favorite outfit of mine to be dry-cleaned and I needed it done quickly. I was traveling out of town on a business trip a couple of days later and I had a short window to get the dry cleaning done. I did some research online and found a local dry cleaner with same-day service that could accommodate my tight timetable. With that in mind, I put a plan together to drop off the articles on my way to a morning meeting. The dry cleaners was scheduled to open at 9 AM and I had arrived just a few minutes early. I got out of my car to check the door and found that it was locked. “Five more minutes,” I thought to myself as I sat back down in my car. Ten minutes later--and five minutes after the dry cleaners said they would be open--no one had come to unlock the door. Once again, I got out of my car to check the door. Maybe, I thought, the door was already open. Much to my disappointment, that wasn’t the case. I let ten more minutes pass. Now, it was 9:15 AM and my quick detour to the dry cleaners was becoming an inconvenience. I could not miss my meeting and I needed to drop my clothes off. Finally, at around 9:20 AM, Someone came to open the door. They apologized to me but the damage was done. I would be late to my meeting even though I had arrived to the business on time. Our guests expect us to be open when we said we would be. At minimum, we need to be open when we said we would…but why not be open a few minutes earlier? In the business, we often refer to this as a ‘soft opening’. Typically, a soft opening at a zoo, aquarium, or theme park allows guests to enter the facility prior to posted opening time and may include limited access to some areas. The Disney parks have been “soft opening” for years, allowing thousands of guests to pour into the Main Street area of the Magic Kingdom where they are free to shop, eat, and drink prior to official park opening. At the foot of Main Street, a span of red ribbon stretches across the street to prevent guests from passing beyond the holding area until the rest of the park is ready. This operational technique is a great way to take the load off of your front gate before posted opening time. 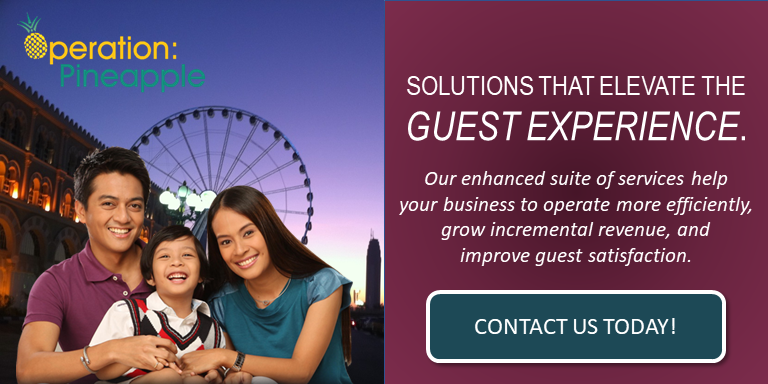 It also has the added effect of increasing guest spending in the early morning hours while also elevating the guest experience. 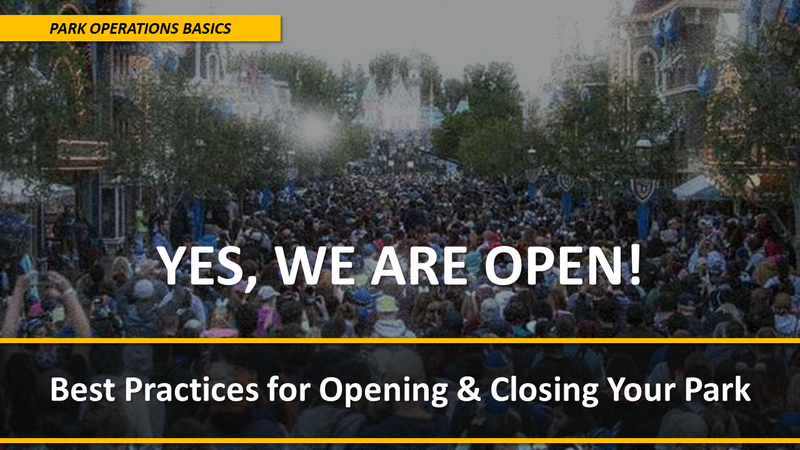 It is a best practice to keep your attraction queues open until posted park closing time. This means that if your park closes at 10 PM, your guests should still be able to enter any ride or attraction queue at 9:59 PM. At posted park closing time, the queue closes and all guests inside of the queue are allowed to continue waiting for their ride. It takes a little longer this way but it’s the right thing to do. This is an organized process that helps to move guests from the back of your park or facility toward the exit in an organized and service-friendly manner. The park sweep typically begins at the furthest point in your facility from the entrance and is conducted with the help of both the operations and security teams. The park sweep is done politely, with patience, and always focused on providing a great guest experience. On the busiest days of the year, many facilities choose to extend their hours beyond posted closing time in order to provide visiting guests with increased time to experience the facility. Doing this requires extensive preparation including notifying your staff that they will need to stay later but the upside can be tremendous. At Disney parks, they extend their hours on a regular basis and even provide their on-property guests with ‘Extra Magic Hours’ as an added benefit. Building in the option of extended hours on peak days can help you to limit refunds and to elevate the overall guest experience.